No time to make a coffee run? 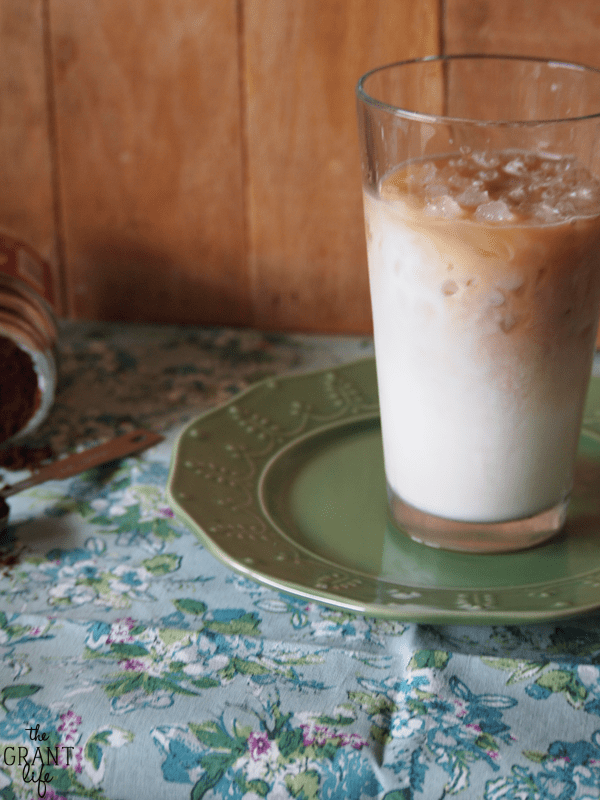 Make this iced caramel macchiato at home! When we go out to eat, I tend to always order the same thing. I’m what I like to call a “create of habit.” I’ll patiently sit while everyone looks over the menu deciding what they want to eat or drink. Not me. I know going in what I want. [Heck, I know before we go in what I want.] Local pizza place? The Jack special, please. Italian food? Bowtie pasta with white sauce, artichokes and sun dried tomatoes. [Please and thank you.] Starbucks? Iced caramel macchiato. And as much as I love indulging by going to Starbucks every once and a while, I decided to create my own. So ya know, I can have it at home. All the time. I linked to the espresso and the syrup to share the brand that I used. You can use any kind, or if you have an espresso maker – use that! So gather up all your ingredients and let the magic begin. Or as I call it “going to my happy place”. No waiting in line required! Is the caramel macchiato sweet? Yes. It gets its sweetness from the caramel and vanilla syrup. Yup. Or espresso. You can use cold brew coffee or fresh espresso instead of the instant. If you want to get fancy, drizzle the caramel down the side of the cup first. 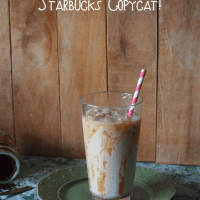 Ice chai latte – another Starbucks copycat! I would so love to make this if my hubby hadn’t used up all of my instant espresso. Pinning for later. Would love if you came to share this on The Yuck Stops Here! recipe link up. Ohh make sure to grab some next time your out! This is sooo worth it! Im heading to your site now. Thanks for the invite! This sounds really good. Pinning so I can have the recipe to try it out soon. Thanks. Yummy! I need to try this homemade version! Thanks so much for linking up to Freedom Fridays! Thanks so much! So glad you like them! Kelley, this is the EXACT same drink that I always get at Starbucks! It’s my favorite, but I can’t wait to try your easy, at-home version! Sounds so good. 🙂 I’m working on a Hawaiian Iced Coffee recipe right now. There’s a local place here that makes an amazing iced coffee with coconut and macadamia, and I’m trying to recreate it. 🙂 Thanks so much for this great recipe! Ohhh!! Let me know when you post the recipe! I want to try it! My dad lived in Hawaii for 6 years and we went over a lot. I love it! This looks AMAZING! Thank you for sharing!! I am going to save a small fortune with this recipe. Thanks for sharing! By the way, I found you at the Mommy Club! 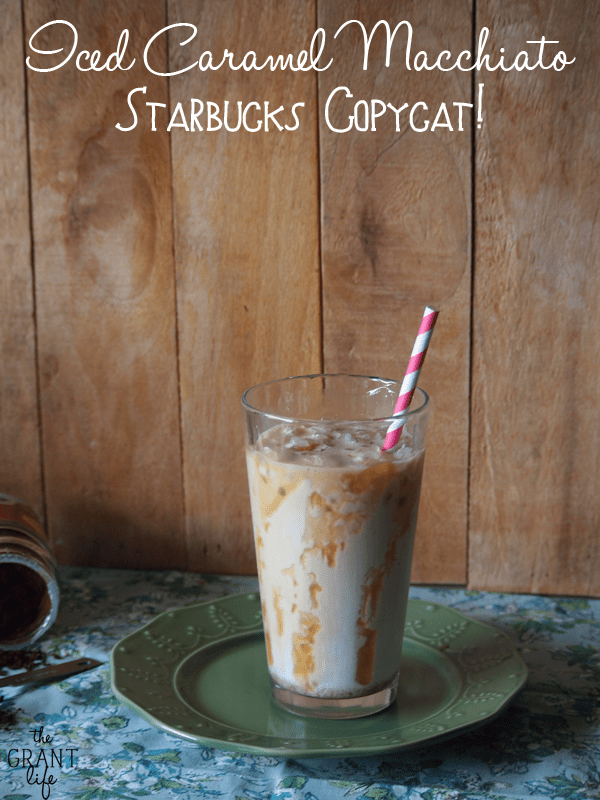 I’ve never tried this at Starbucks, but I’ll be making it at home for sure! YUM!! Thanks so much for linking up on Cook it! Craft it! Share it! this week! Thanks Ang! Its one of my favorites and I love how easy it is to make at home! Mmmm, those are my favs at Starbucks, second only to chai lattes! I featured this on my blog this morning and I’m just stopping by to pin it! Thanks Jessi! Im going to go check it out! Ohhh, yum. Definitely keeping this one in the back of my brain… 😉 Thanks for sharing it at Savoring Saturdays! Coffee-wowness and then some! A must try. Thank you so much for sharing! SO much better than spending $5 for one! This look INCREDIBLE! I can’t wait to try making this! Love looove the Starbucks’ caramel macchiato, but it’s so expensive on a college budget. I’ll definitely be giving this recipe a try, thanks so much!! Also, the Starbucks brand vanilla syrup is a few dollars cheaper than the Torani and you get more per bottle… for those on a budget or just looking to save a few extra dollars! Oh my gosh, this sounds so great. However, I have to tell you, one of my biggest pet peeves in the world is when people call it eXpresso. It’s eSpresso. A quick update and you’ll have a million more coffee lovers rootin’ for ya! Oh my gosh! Thank you so much for correcting me! This post is over 2 years old.. how embarrassing! It is all corrected. Thanks Jenny! Hooooray!! So glad yall liked it!! I’m a barista at Starbucks, so if you want this to be just like the caramel macchiato we serve, don’t stir it. The word “macchiato” means “marked” in Italian, so the espresso and caramel drizzle are supposed to “mark” the top of the drink. This is part of what makes the drink different from an iced vanilla latte, which would have the espresso on the bottom so it mixes with the syrup and milk right away. Just a helpful hint ? SUPER HELPFUL! I appreciate the feedback Amber. I’ll edit the recipe soon! Thank you! 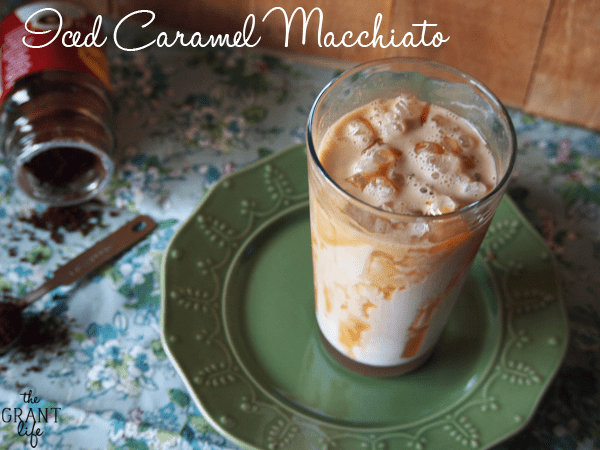 Hi, I found your iced caramel macchiato recipe and am going to try this but I have a question as to what caramel brand do you use? Or where can I purchase the caramel? I really like the Torani brand caramel – https://amzn.to/2rVePrt. You can buy it at most grocery stores or on Amazon. I hope that helps!